England will play France, Colombia and Mexico in Group F at the 2015 Fifa Women's World Cup in Canada. Mark Sampson's side, who won all 10 games during qualifying, will open against world number four France in Moncton on 9 June. Hosts Canada are in Group A with China, New Zealand and Netherlands. After playing France, England will face Mexico on 13 June, also in Moncton, before travelling to Montreal to play Colombia four days later. The tournament runs from 6 June to 5 July. From the six groups, 16 of the 24 teams will advance to the knock-out stage. 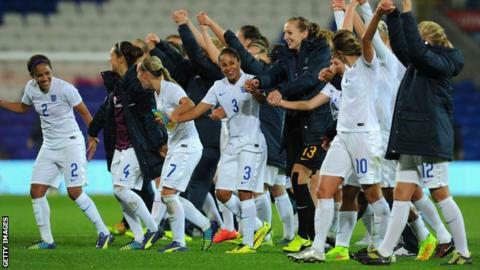 "It is an exciting draw for us, three teams with very different playing styles," said England manager Sampson. "The first game will be a very big challenge but [France] are a team we know a lot about. "We have to work hard now and get ourselves ready for the tournament, but we feel we can progress from the group." Defending champions Japan are in Group C and will play Switzerland, Cameroon and Ecuador, while two-time winners USA will face Australia, Sweden and Nigeria in Group D.
There was some confusion midway through the draw as Colombia were drawn in Group E with Brazil - teams from the same confederation cannot be drawn in the same group. As a consequence, Colombia were put in Group F, with South Korea then placed in Group E.
The exception to the rule concerns Europe. Germany and France have both been drawn in a group with another European team. England, ranked seventh in the world, will host the USA and France in two friendly matches in the build-up to the finals on 13 February and 9 April respectively. Next year's World Cup will be held in six different cities, across five time zones, with the top two teams from each group joining the four best third-ranked countries in the last 16. Every game will be broadcast by the BBC, on BBC Two, BBC Three and the Red Button. Radio 5 live and the BBC Sport website will also offer extensive coverage. During the first 48 hours of sales in September, more than 150,000 fans bought tickets for matches, right through from the group stages to the final.